Oil Beetles (Meloe spp.) are unusual beetles with a fascinating life cycle. Like their Rove Beetle cousins, the typical hardened wing covers (elytra) in beetles are very short, not covering the abdomen. Their names are derived from their habit of exuding a noxious oily substance from the joints of their legs when disturbed. This substance (including a chemical called canthardin) can cause chemical burns and can protect certain species of beetles such as Blister, Soldier, and of course Oil Beetles. The Meloe males are smaller than the females and some of the 22 or so species in our region have a bend to their antennae. The females attract their mates using pheromones this time of year. Adults feed mostly on plants, but the larvae have a very specialized diet and host. After hatching, the new born larvae in some species climb atop foliage and exude a pheromone attractive to certain bee species. Some even aggregate together so they look like a female bee. The male bees then arrive and the Oil Beetle larvae cling to their hair before they fly off. When the male finds a real female bee, the Oil Beetle young transfer over. The female bee then constructs her nest and the larval Oil Beetles eat the eggs and pollen stores. The cycle then starts all over again. I recently came across several mating Oil Beetles and noticed some much smaller beetles that seemed to be feeding on their larger cousins. What I had stumbled upon were Fire Colored Beetles from the family Pyrochroidae harvesting that blistering agent called canthardin from the Oil Beetles. The males of certain species of these Fire Colored Beetles detect the canthardin using their combed antennae and find it irresistible. Fire Colored Beetles (Pyrochroidae family) obtaining canthardin from Oil Beetles. Some Pyrochronidae males seek out Blister and Oil Beetles to collect the cathardin they exude. Those who collect the most are also the most attractive to females of their own species. When mating with them, the males transfer cathardin along with the sperm packet to the females who chose them. The females then coat the eggs they lay with the blistering agent, thus hopefully protecting them from many predators. Three male Fire Colored Beetles harvesting cathardin from the much larger Oil Beetles. These beetles display just some examples of the remarkable use of chemicals and pheromones in the animal world. These are not just used for attracting mates, but in Oil Beetles to attract bees to act as hosts. In Fire Colored Beetles, they steal these chemicals from their larger relatives to be more attractive to their own females and then protect their eggs. There are numerous other examples such as these taking place daily in the world around us. This time of year, the presence of Callery Pear becomes quite evident. Overshadowing the magnolias and foreign cherries also in bloom, these invasive plants really dominate the landscape, particularly along edges and old fields. They are quite beautiful actually, despite the flowers' smell that some people dislike. This along with their quick and compact growth, "pest free" nature, and tolerance for such a wide array of soil and environmental conditions, make it an extremely popular landscape plant. That it was also self-incompatible, so would not produce messy fruits, was also considered a plus. However, most of these traits also make for an invasive species. This would not have been an issue if they did not reproduce, but that particular trait failed. Although the various cultivars, especially the popular Bradford Pear, could not reproduce with their own type of cultivar, so many different cultivars were planted that they indeed do cross pollinate each other. So these have now become an invasive tree species. You can really see how invasive they are this time of year when the white blooms make these plants evident all over our countrysides. They are pioneering species in fields and meadows, sometimes forming monoculture forests. Trying to manage and control their numbers costs natural resource agencies a fortune, but is necessary to preserve habitats. You can do your part to eliminate seedlings, supporting local management efforts, and of course not planting any of the cultivars of Callery Pear. Be observant next time you're out and see for yourself just how dominant they are. There are so many reasons not to plant this tree besides besides their invasive tendencies that out compete native plants and crowd them out. Their pest free nature actually means that they do not support much in the way of native wildlife, no where near what native flora can support. 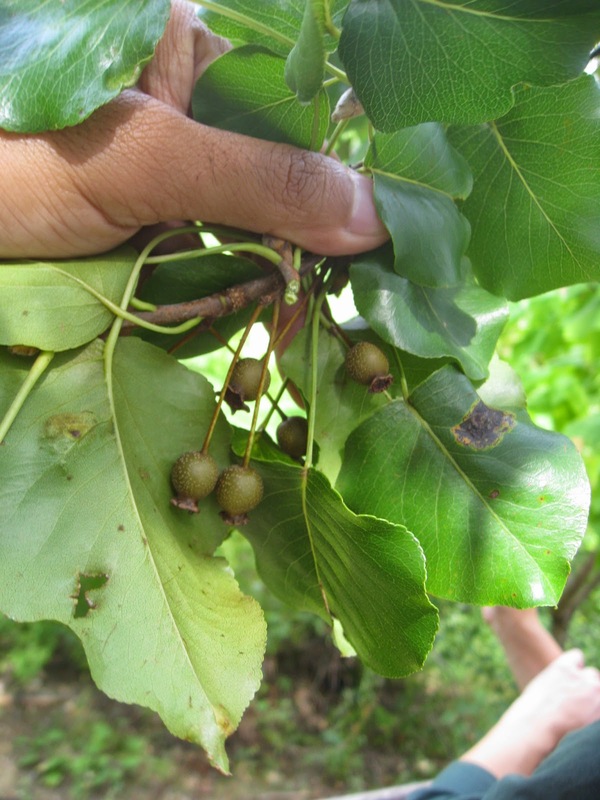 The woody fruits (pears) are eaten by birds once frost softens them, that is how these are spread. But by my own personal observations, it seems that European Starlings are among the birds who do this the most. They do not provide as much as native plants, but often are one the few options left. The wood is also fairly weak and prone to breaking and dropping branches. All in all, there are much better native landscaping options available. Northern Spring Peepers (Pseudacris crucifer formerly Hyla crucifer) are among our smallest frogs. These tiny treefrogs only get to 1.5 inches when full grown. The males are even smaller, not even making it to that size. They may be small, but they sure do make some loud calls. Some say they're all "peep" and many consider their calls synonymous with Spring. Like most frogs, only the males call, forming a large chorus who's sound can carry for quite a distance. I recall one particular night long ago (one of the legendary "big nights" that herpetology fanatics always talk about when all the environmental conditions are perfect resulting in huge numbers of amphibians coming out to breed) quite well. The Peepers were so loud that I had to yell in order for my future wife to hear me, though we were barely twenty feet apart. When we left that night, the sound had been so deafening that our ears rang for an hour after leaving the swamp. Unfortunately, though I've seen some other "big nights," I've never heard that many treefrogs (and toads and even wood frogs that evening) calling at once again. Outside the breeding season though, Peepers are rarely seen or heard. They have excellent camouflage and can actually change color to some degree. This makes the often cited "X" field mark on their backs sometimes difficult to discern. Since they can climb into low foliage as well as hide under the leaves, they have numerous places to hide their small selves. A pair of Spring Peepers in amplexus. Mating takes place in typical frog fashion: with the smaller male on top of the female in a mating position termed "amplexus." The females usually lay their eggs singly or in small batches attached to underwater objects. The eggs are tiny (though they can lay 22-1200 eggs per female) and so the resulting tadpoles are small as well. They metamorphose 45-90 days later and leave the pond or vernal pool they were using, sometimes traveling a fair distance from water. Peepers normally lay a single egg or a small batch, but this one laid several of them together because it was in captivity with limited options on where to lay them. Spring Peeper tadpoles are small indeed. Spring Peepers are also remarkably cold tolerant, being able to survive even if portions of their bodies freeze due to production of high glucose levels in their blood system. These treefrogs often will overwinter under leaf cover, but usually above the frost line. Though known for calling in the early Spring, males sometimes get confused by the similar length days and temperatures of the Fall and will occasionally call then as well. This is sometimes referred to as the "fall echo." A male Northern Spring Peeper calling. Harbinger-of-Spring is also called Pepper-and-Salt. One of the earliest of our native native wildflowers to bloom is the tiny spring ephemeral called Harbinger-of-Spring, or Pepper-and-Salt (Erigenia bulbosa). It often blooms as early as February, sending up a small umbel of white flowers with red anthers that soon turn black (and giving the pepper and salt appearance). It is one of the few native plants with no known symbiotic fungal (mycorrhyzal) associations, though it does host a type of rust Puccinia erigeniae. This fleeting wildflower is actually in the carrot family and its bulbous minuscule root is edible. The Cherokee also used the plant as a treatment for toothaches. Although it is easy to overlook, it is none-the-less not considered common in most locations, and since eating its root kills the plant, that is strongly discouraged. A certain mining bee, Andrena erigeniae, is said to need this plant's pollen in order to reproduce (an oligilectic relationship) and includes the plant's name in its own due to thie perceived relationship, but now many believe that though this bee likes to visit visit its flowers, it actually requires Spring Beauty (Claytonia spp.) pollen in order to reproduce. Here's a short video of this spring flower: https://www.youtube.com/watch?v=RFOh6LI4YtI . Instead, enjoy this early spring wildflower, knowing that it is among the first of many other spring ephemeral flowers soon to appear in our rich, dark, often moist, woods, a true Harbinger of Spring. Harbinger of Spring is one of the first flowers available to early pollinators like this solitary bee.